To share this story is easy, yet the challenge is to keep it simple and honor it without clichés or overly-used expressions. Like many of us, we have experienced the connection with our animals that we acknowledge is beyond special and rare. Bob is the key to my life and he makes it extraordinary and more. There are times in our lives that create incredible sadness. In addition, very unexpectedly, they can be followed by phenomenal happiness. Such is my life and it goes on. It was at a very sad point in my life that I met this dog name “Bob.” (Where the name Bob came from will be explained later). 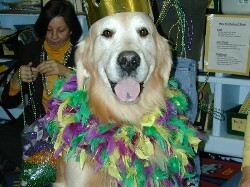 My Golden Retriever Max had recently died at the age of 14 ½ years in February of 1996. Two days later, I found myself driving to Denver for a post-graduate internship at The Children’s Hospital, accompanied by my other Golden Retriever, Amos. The tears flowed and naturally, we were both very depressed. Now there were two, and the absence of Max was profound. Recognizing that Amos in particular had lost his best friend, I decided to look around for a companion for him. 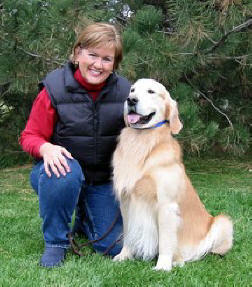 Within a week of arriving to Denver, I had the greatest luck and met Anne Shannon and Claire Caro who owned “Bob.” Given their individual needs and breeding goals, “Bob” was not a “keeper” due to a tail carriage that was not in line with the Golden Retriever breed standard. This type of tail carriage is considered a “fault” in the conformation ring, which meant Bob was most likely not going to receive any blue ribbons; therefore, because of their breeding goals, Bob needed to be placed. I took one look at Bob, his tail, and was overwhelmed at his handsome looks. Being a total novice at the “show ring” game, I considered this tail absolutely beautiful! And on March 17, 1996, Bob came home with me and a new chapter in my life began. I have to acknowledge that Bob was special and unique in his own right. Yet, like many outstanding dogs, the owners are the ones who shape and foster their unique qualities. 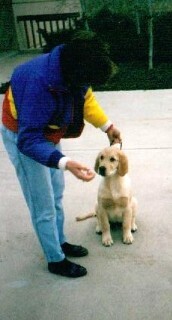 Claire Caro (a Denver Pet Partner) had been in Goldens for many years when we met in 1996. Her knowledge, experience, and enormous talent are a big part of Bob’s character. The method of incorporating a dog into your life is something Claire understands. Bob is unique yet owes Claire a big "thanks". For a little family history, Claire was handling/showing Bob’s mother “Hope” (whose owner lived in North Carolina) here in Colorado. Hope was beautiful and talented, and getting closer to championship. Yet during these quests, sometimes the “biological clock” ticks and before Hope could reach the 15 points required (she had 14 to date) to achieve her championship title, she was bred and delivered Bob and his littermates on December 24, 1994. Fast forward.... Bob made a wonderful contribution to our family. He bonded with Amos and introduced me to the world of dogs. This new world included traveling to dog shows to support friends, obedience classes, and even having Bob serve as my “school pony” while I attempted to learn the sport of handling dogs. As I learned more about dogs, the human-animal bond became an area of interest to me. I was working as a psychotherapist/art therapist intern at Children’s Hospital and remained very interested in this unique healing tool. Luck struck again when I learned about the pet program at Children’s called Prescription Pet. Judy Dalton and Sarah Mark, DVM were the pioneers who spearheaded this program. Today, many hospitals all over the country are using it as the model for their own pet visitation programs. With the support of the psychiatric team, I learned more about becoming involved in this field and I wanted to bring it specifically to the psychiatric units. After a trip to Boston for Delta’s Annual Conference in 1998, completion of the Pet Partners TEAM Training Course, and determination, I found myself back in Denver under the leadership of Diana McQuarrie and became a certified Pet Partner Team with Bob in 2001! Unfortunately, my father’s Alzheimer’s was worsening and the time available for participating as a Denver Delta Pet Partner Team was very limited. Bob and I kept our interest in working as a team and finally, in the fall of 2003, we were recertified. Around this time, DPP was looking for teams to work in schools. Because I work in a hospital, the school environment was a chance to offer further educational opportunities and to make a contribution with my professional background. With a background in psychology, it seemed a good fit. “Good fit” is an understatement! January 2004.... Bob and I began working as a team at University Park Elementary School (UPE). The “Special Needs/Emotionally Disabled” classroom was our designated location. Teacher Tracy Dodd, M.Ed. who has over 24 years of experience in teaching, leads this classroom. Barb Lamana, LCSW, manages the therapeutic aspect. Tracy and Barb embraced Bob and me from day one. 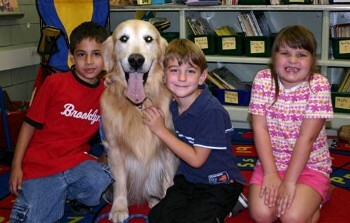 Their extensive experience was apparent and the incorporation of animal-assisted therapy into the classroom was easily woven into the daily curriculum. The seven children in this classroom have a variety of diagnoses that include Attention Deficit Hyperactivity Disorder (ADHD), Bi-Polar Depression, and Post Traumatic Stress Disorder. Barb Lamana, who understands deeply the benefit of animal-assisted therapy, is due full credit for establishing the program at University Park Elementary. With Barb’s guidance, support by Tracy, and the blessing of UPE’s principal Katherine Johnson, animal-assisted therapy is now a part of the learning opportunities at UPE. In January 2004, “Life Lessons with Bob” was launched. Today, Bob and I head for University Park Elementary every Wednesday for a morning of group and individual work with the children. The behavior changes in the children have been profound. Even on the days when Bob and I are not present, the children announce daily the number of days until we return. All have noted emotional and academic benefits. Clearly, the role of animal-assisted therapy has its place in this classroom. The time with Bob centers around various monthly themes such as feelings, friendship, respect, family, caring and giving. Bob is tied into each theme. The connection between Bob and the children is palpable. They have learned lessons regarding these themes yet mostly, the children have discovered so much about themselves. The lessons also instruct and enhance their lives at home and other places in their world. Unexpected lessons have also come up. This past October, Bob had surgery to remove a potentially life threatening tumor. This time was difficult for Bob, for me and the children who have become so accustomed to his presence on Wednesday mornings. While Bob was recovering, the children wrote notes of wishes for a quick recovery, included their own drawings of Bob and words of how much they missed him. Upon Bob’s return after a few weeks out, the children greeted him with hugs and kisses, smiles, and a real sense of excitement and relief that he was finally back. Moreover, for the first time, they were able to verbalize their feelings, a lesson not so easily learned. To have the children use this event to describe their feelings was an unexpected achievement. Rather than detail the individual lessons, I will highlight the Dumb Friend’s League (DFL) Project this February. To broaden the incorporation of Bob into the children’s lives, Tracy, Barb, and I decided to give the children a chance to fulfill UPE’s (optional) Community Service Project. We selected the Dumb Friend’s League. After learning about the needs of the animals in the shelter on the internet, we set up a schedule of activities that would conclude with a field trip to the DFL. 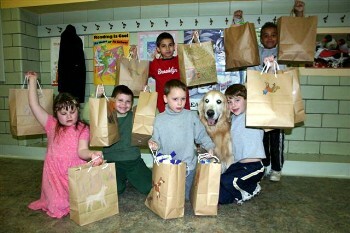 The children decided upon “Care Packages” for the newly adopted dogs to take with them to their new homes. Each child was asked to bring in any of the following: toilet paper rolls, a yard of fleece, dog food (dry and canned), and dog toys. Each week we set up activities and one of the children’s favorites was making the “Homemade Dog Biscuits.” Due to problems staffing and finding cars large enough to transport the seven children and staff, everyone traveled to the DFL by bus which made the trip all the more adventurous. Bob and I met them at the shelter. Everyone attended a DFL class on “How to Care for your Dog/Cat.” The children had a chance to share their knowledge with the instructor. The tour of the shelter was filled with dogs, cats, bunnies and even “Fred” the rat. After presenting the care packages, it was time to get back on the bus. The children felt very, very special. Experiences like this are rare. To have a chance to offer your time, and a bit of knowledge, all the while having lot of fun with your favorite dog at your side is even rarer. We all owe thanks to Bob. Like all people who are absolutely, certifiably crazy about their animals, I treasure every day with him. I owe him thanks for teaching me “Life Lessons” which have made me a better person, owner, and teacher. I truly have been given the privilege of having such an incredible animal in my life. Bob is now ten years old and according to Golden Retriever breed statistics, he is living “on borrowed time.” The early morning hugs and kisses are a daily highlight for me and I am doing my best to memorize them all. Thank you, Diana, for providing Bob and me with the guidance and opportunity to make our lives so very rich. And for everyone who understands the Human-Animal bond and are fortunate enough to experience it every day, let us count our blessings, everyday, and every one of them. Editors Note: “BOB” has significant meaning in the dog show world, and that meaning is something I have always attributed to Suzie’s handsome Golden boy ever since I first saw him…..”Best Of Breed”. Tail carriage aside (sorry, Claire), Bob is truly one of the most outstanding looking Golden Retrievers that I have ever seen. Far beyond that however, and even more important, he has a wonderful soul and possesses a stoic and gentle spirit. I truly believe that one of the secrets to Bob’s longevity is his work as a therapy dog. It has great purpose and is full of reward for both give and receiver. Claire Caro, thank you for loving Bob enough to let him go so he could realize his full potential with Suzie. Only a very special heart has the power to do this. Suzie Kleck, thank you for loving Bob enough to recognize what his potential was and to nurture it. Denver Pet Partners is honored to name you, Suzie and Bob, as Pet Partner Team of the Month for your selfless dedication to enhancing children’s lives through animal-assisted therapy and embodying the human-animal bond in your Pet Partner activities.